THE Conservatives are sick of being told that their internal differences of opinion on Brexit could be a damaging factor in Camden’s council elections – now less than two months away. One of the loudest voices delivering this warning, after all, is their intensely pro-EU former leader, Andrew Marshall, who left the party and now sits as a Liberal Democrat councillor in the council chamber. The Lib Dems, looking to woo Remainers from both Labour and the Tories, are clearly keen for the topic to stay high on the agenda in the final run-in, even if their rivals say people should vote with a mind on local issues. Like bins. 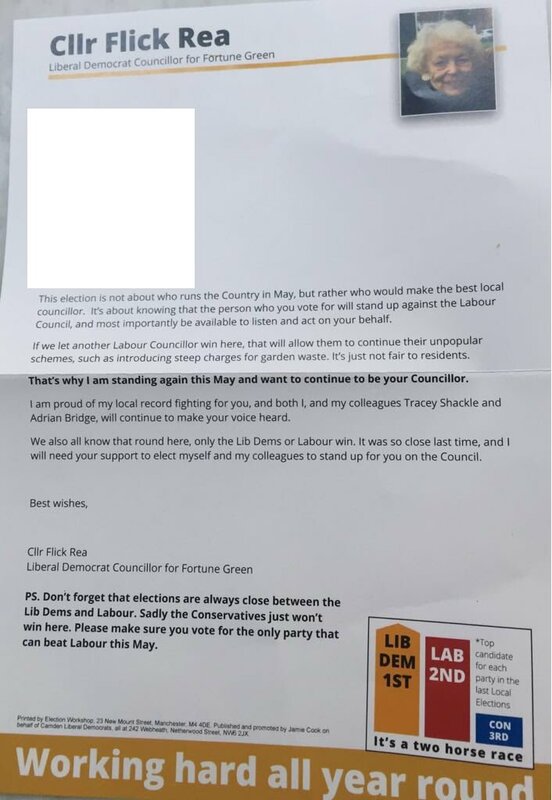 As with all of these leaflets, there’s also the message that the Conservatives can’t win here, although it’s hard to remember it’s been put as politely on Lib Dem literature as: ‘Sadly, the Conservatives just won’t win here.’ What is it that makes them so sad? Cllr Rea – the only survivor of the party’s 2014 meltdown in Camden – is under threat, but if she does hold on it would be interesting to see which of the Labour candidates misses out, two of which are sitting councillors seeking another term. There is much talk of split voting in that particular ward. For the benefit of newcomers: you get three votes, one for each seat in the ward, at this election. 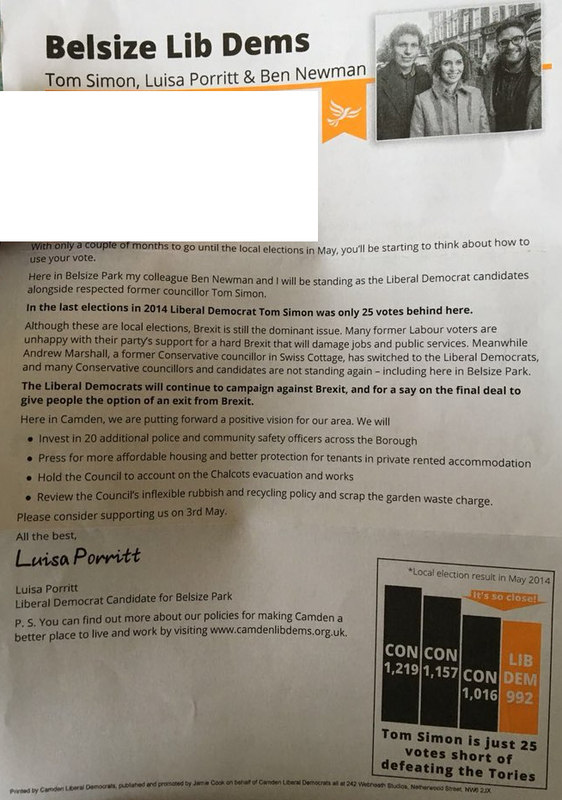 But zip over to Belsize, where all three Lib Dem candidates are lucky enough to be pictured on the leaflets, and, regardless of what Cllr Rea’s leaflet says on her sheet about going local, there is different messaging. Here the campaign is proudly national, international even. “Although these are local elections, Brexit is still the dominant issue,” we are told, before more promises to fight the UK’s divorce from the European Union, as if Cllr Rea hadn’t just told residents that this vote isn’t about national politics.